Keiser Ethical Silver (KES) present a unique opportunity to purchase fine .999-pure recycled silver one-ounce rounds. The name "Keiser" refers to Max Keiser, a world-famous TV presenter, radio host, entrepreneur, broadcaster and journalist, and financial commentator. He hosts Keiser Report, a financial program broadcast on RT (Russia Today). Max Keiser is famous for his promotion of silver as an investment and as a form of protection against the debasement of fiat currencies. The obverse features a detailed image of a bank vault surrounded by Max Keiser's slogan "GLOBAL INSURRECTION AGAINST BANKER OCCUPATION." 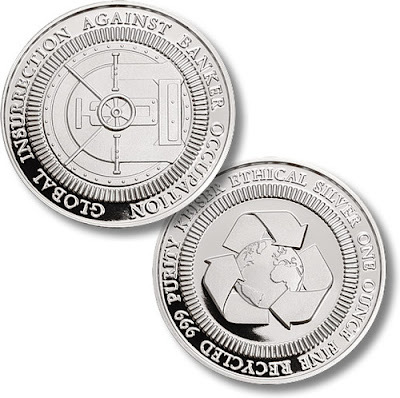 The reverse bears the recycling symbol surrounding the globe.